95FZR600 wrote: No problem. Well Mszilves came up with the diagram. Its pretty simple. The fjr speed sensor was used on his but I used the R6 and had to space it out some with a washer. The relay is your standard automotive relay from autozone and the wiring is what it is. Most of the details and questions are on the main thread on the archives. I might just bring them over here to make it easier for all of us. I used the FJR sensor too, but am still spacing it a little otherwise it touches the gear, the speed healer is required to correct the speedometer. As for the relay with out it the oil sensor will stay on even when the bike is off and will drain your battery. so the relay switches the oil sensor off when the bike is not on. this relay is 12V what amperage, single / double pole ? the white box is the for the Tach, it converts the analog tach signal to a digital signal. this is available from where? can it be home made ? A 1ohm resistor is required to ground the gas level signal and turn off the light, if you don't have a yzf tank conversion. 1ohm wire wound / carbon film ? , wattage required? FJR sensor and Speed healer is from Ebay, I got a FJR Yamaha speed healer. yamaha_george wrote: this relay is 12V what amperage, single / double pole ? yes on 12v, I went down to the auto store and asked for a standard auto relay, got that, and after thinking about it hard and long I figured out how to use a high/low beam R6 relay for it. yamaha_george wrote: this is available from where? can it be home made ? Mszilves sells them, I think he also will provide the instructions on how to make them. yamaha_george wrote: 1ohm wire wound / carbon film ? , wattage required? never worried about it because I am doing the yzf tank swap. I would like to say I really appreciate this how to, so thank you to all involved. But I would like to ask for some help with my Fzr400 R6 Hybrid Project. have built the Signal convertor box. Now I would like to mount the digital speed sensor to the transmission but I would like to know if anyone can give me the correct position of where to put sensor. Eg. Dimensions, as I do not want to drill in wrong position. If anyone can please help I would greatly appreciate the help. Apart from the how to there was a lot of discussion on this in the Forum and i do remember asking those involved to give dimensions unfortunately I am not so sure that the reply there would bear on the fact you are using a 400 engine I think most had 600's. Vertical location should be fairly simple; lateral location could probably be determined by lying the bike on its side, removing the oil pan, and deciding which gear is #6. Keeping / removing the chips and swarf from your gear box is left as an exercise for the student. As to the various adaptations, I've done some serious pondering. I've gone over MSZilves' circuit a few times, and while ingenious it strikes me as quite over-thought and complicated. Contrary to popular belief, it isn't dividing or multiplying the tach pulses. but is rather reading the crank sensor directly and turning those 4 peaks into 2 square pulses per rev. This can be done far more simply with 2 diodes and a resistor wired to the coil control wires; each coil fires once per rev, so a combined signal from each should keep the R6 tach happy. There's a comment above about using a 1 ohm resistor to ground out the fuel light if you don't have a fuel sensor. The conversion chart done up by mszilves indicates a 1k resistor - a significant difference. The oil switch relay is simple to do, but can be replaced by a MOSFet and a pull-up resistor. The coolant sensor used on the early R1 and R6 is the exact model used on the FZRs, so that wire from the gauge can be wired straight into the FZR harness; the B/L wire shown as part of the coolant sensor pigtail would be connected to ground. I have a board laid out that I'm fairly happy with, for both the tach and the speedo. I have a source for the plugs for the FZR gauges; I'm trying to track down a source for the connector that plugs into the gauge itself. So I am currently working on this mod. I am right up to the point of hooking up my wires to my dash for my Speedo and tach. I want to use my multimeter to test the signal. What should I be looking for? Can the blinkers speed sensor white/ green wire be spliced into the speedo healer? Yes; this is actually shown on the combined wiring schematic. The only point to ponder is that I have been unable to confirm just what the FZR pulse rate is. If it's one pulse per front wheel rev, and your sensor is pointed at a 30 tooth gear with a 15/46 final gearing, the flasher relay is going to see 9.8 pulses per rear wheel revolution, and the flashers will turn off a LOT sooner than before! This could be fixed with a simple frequency divider (s simpler version of the 'speedo healer' circuit itself), or simply lived with once you were aware of the situation. The flashers will keep going while stopped, just like stock. Hmm. So would it be bad to have the w/g wire going from Speedo healer then "y'ing" to the flasher and dash? The W/G wire to the flasher relay can be spliced off from the speedo healer; don't connect the W/G wire from the speedo pulser to anything. The normal flasher wiring will take care of the dash light. I am doing this for my R4 project bike. For the speedo I will use a GPS sender. 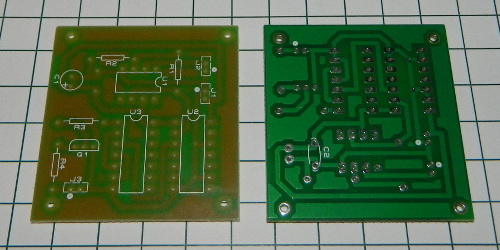 For the tacho I had some PCB boards made. I will be selling them at a very reasonable price once they have tested to be functional. handy with a soldering iron then get in touch and I will ship one off to you.